Back in the summer of 2005, Dr. Al and his daughter Laura traveled to Africa to work for a couple of weeks at a missionary hospital. Here's what he reported just before the trip began. The town is Aba. 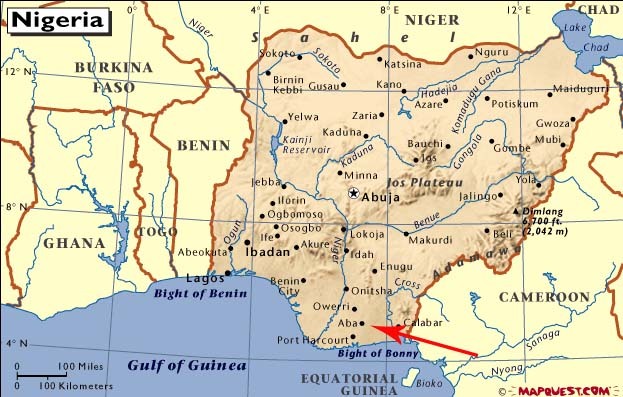 It is 60 miles inland (north) of Port Harcourt, which is where we fly to from Paris. They will pick us up in a van. It is about straight south from Paris. It is the Nigerian Christian Hospital. It was started by the Lawrence Avenue Church of Christ (Nashville) in the '50s I think. We will live in a big house and pay $5 per day for lodging, meals and twice a week laundry. We'll sleep under mosquito netting. They suggest that you don't go out at night because of the mosquitoes. They have one nurse there who does anesthesia. They save up the surgery they can and people go over 2 or 3 times a year and do them. Nigeria is a member of OPEC, so there should be money for health care, but there is corruption etc. If you have money you get it, if you don't, you don't. Laura and I are flying from LAX on July 9, non stop to Paris (eleven hours). Then to Nigeria on the 12th. We are leaving a day or 2 early to have just a little time in Paris. We will be back in LA on July 30. I checked on the climate online. There is an average of zero snow days in July. Nigeria is near the equator so the temperature doesn't change much. There are wet and dry seasons. Use the links near the top of this page to read all about Al in Africa.